We discovered years ago, this amazing format that provided s a gigantic open rate and high response. When we first started out offering marketing services to the hearing aid industry, the Christmas Holiday time was slow for us. Practice owners were hesitant to spend marketing dollars during the Holidays, thinking customers would not want to spend money on something like a hearing aid during the gift buying season. With the Holidays comes lots of time spent with family, and too comes your customer’s realization that the time has arrived to finally do something about that hearing loss. In comes your friendly invitation to offer help. Our invitation format looks like a greeting card from the outside, providing great open rates. 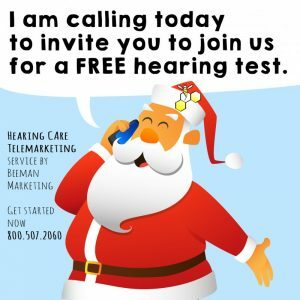 Once opened, your customer is not tricked into yet another salesy pitch – but invited to a special Holiday open house to receive something he or she really need for the Holidays – help with a hearing loss! so here is your reminder note to call now. Don’t miss your chance to finish up 4th quarter with a bang. 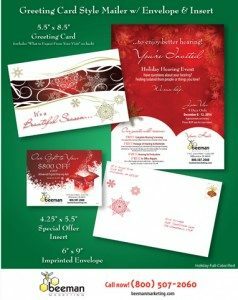 All Christmas Holiday promotions must be finalized by Friday, Nov 14th. Here’s to a great end to your year and a very happy holiday season.